Choose this option to open the "Set Fields Rules for the Table" window. 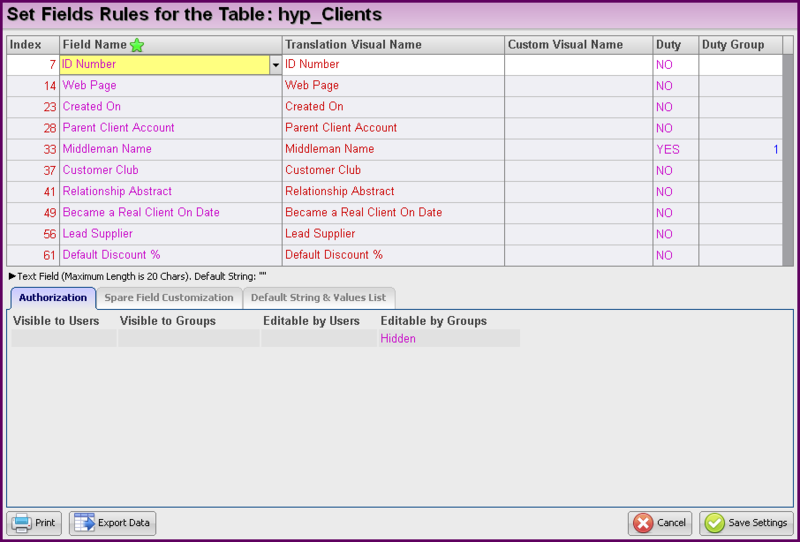 This window allows to set the definitions and the authorizations for each of the selected table fields. All definitions are available according to the user authorizations. Authorization - this tab is used to define authorizations for Users / Groups. Leave these fields empty if no authorizations are required (the field will be visible / editable to all users / groups). Spare Field Customization - Set definitions of the selected spare field. Default String & Values List - Set the values for the selected fields. Index The field Index number. Field Name The name of the field, as defined in Hyper. Translation Visual Name The visual name of the field. Custom Visual Name customized visual name for this field, according to the users preference. Duty Set field as mandatory. The user has to fill in a value in mandatory field in order to save modifications. Mandatory fields will be marked with a star. Duty Group Create a group of mandatory fields. the user has to fill in at least one of this group fields in order to continue. In order to set a Duty Group, choose YES in the "Duty field and write a group number in the "Duty Group" field. Also, for each of the fields in this group, go to the "Default String & Values List" tab and choose YES in the "Override Duty Settings" field. The definitions of these fields can be printed by using the Print button. Alternatively, the user can use the Export Data button to save these definitions to file. Visible To Users Choose the required users from the list to allow them to view this field. Visible To Groups Choose the required group from the list to allow its members to view this field. Editable by Users Choose the required users from the list to allow them to edit this field. Editable by Groups Choose the required group from the list to allow its members to edit this field. Multiple choice is available for each definition in this tab. Choose the required field from the list of fields in this window, or create a new field by adding a new row (Ctrl + Enter). Integer - allow integer numbers only. Real - allow real nembers with a decimal point. Money - this field will contain an amount of money. The value can have two digits after the decimal point. Any additional digit will cause a rounding of the amount. Date - a date field with a mask of DD/MM/YYYY. Choosing this kind of field and choosing "Select" in the "Editor Type" field, will display a calender when trying to fill in a date. Hour - a time field with a HH/MM mask. FixDT - This kind of field allows to fill in a date and hour. Bool - Boolean field. The user can choose "Yes" or "No". Status - Status field that allows to choose a value from a list. The user should define the list of values in the "Default String & Values List" tab. Month - This field contains the Month and the Year. Week - This field contains the year and the number of the week in the selected year. String - text field (up to 60 chars). Serial - a string field (up to 60 chars), with only letters or digits and no space. Name - a text field (up to 60 chars). Phone - a phone field. Spare Group StrFld - a long Text field (up to 400 chars) with the same options in the "Kind" field, but additional options in the "Editor Type" field. Edit - Fill in a text according to the field Kind. Select - Select a value from list. SelectEdit - Fill in the field or select from list of values. SelectGroup - multiple selection option. Memo - text box with available editing tools. TextMemo - text box with no editing tools. Check Minimal Value - Define whether to have a minimal allowed value. Minimal Value - Define the minimal value. Check Maximal Value - Define whether to have a maximal allowed value. Maximal Value - Define the maximal value. Please note - the system will not allow to fill in values above or below the defined range of values. In that case the system will automatically fill in the maximal / minimal values. Override Duty Settings Choose whether to override the current duty settings. Override Lang Settings Choose whether to override the language settings with the definitions of the following two fields. Local Lang Choose whether to display the field name in the local language. Validate Lang The system will verify that the text is written in the local language. Values List List of values for "Select" field. Each value should be written in a new separate row. Default String The default value from the list. This value must be one of the values in the list. For a Text Field, the field with the default value will be considered as filled (e.g. " -- Choose Country --").